I recently heard about the launch of the coaxial watch. Could you explain its mechanism and why it is so revolutionary in the mechanical watch? There have been hundreds of different types of escapements created over the years but many were produced only as a single prototype or in a very limited series and thus quickly fell into oblivion. Others had a somewhat longer existence but were eventually abandoned because of difficulties in fabrication or because of their mediocre performance. To this day, we can affirm that only five escapements have been produced in fairly large quantities and which have endured during a reasonably long period of time. The first one was the verge escapement (sometimes called the crown-wheel escapement). It can be considered the granddaddy of them all, since it was used uninterruptedly in both clocks and watches from the origins of mechanical horology in the early 1300s all the way up to the middle of the 19th century (Figures 1a & 1b). 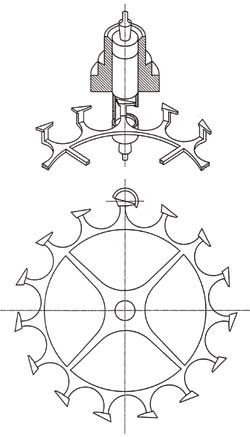 Figures 1a & 1b: Verge or crown-wheel escapement. The crown wheel acts alternatively on the upper and lower pallets of the arbor, which itself serves as the balance staff. Beginning in about 1720, however, the cylinder esca-pement began to give this device some strong competition. Invented by the great English clock maker, George Graham, the cylinder escapement was used to equip thousands of watches until the early 1950s. It was also the preferred escapement of the gifted French horologer Ferdinand Berthoud (1727-1807), one of the creators of marine timekeepers during the end of the 18th century (Figure 2). The world's centre for the production of this escapement was in the Haut-Doubs in the Franche-Cont region of France near the Swiss border. During the same period, the Duplex escapement, although probably invented in France, was used primarily in England. View of a cylinder escapement. 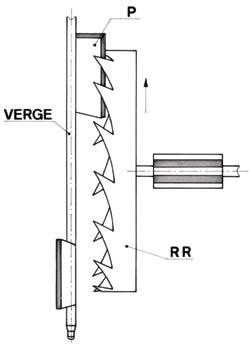 Figure 3: Duplex escapement. The two coaxial wheels turn in the direction of the arrow. The largest is in its locked position against the balance staff. Better, but more delicate than the cylinder escapement, this device is interesting in light of the new Omega innovation. 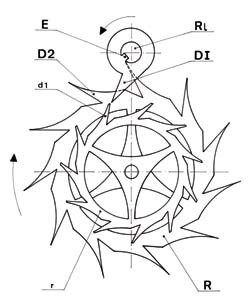 In fact, the Duplex escapement possessed two superimposed and concentric wheels. The larger one assured the locking or rest position while the smaller one provided the impulse (Figure 3). The current coaxial escapement uses a part of this device. The three escapements discussed above all had one large drawback that caused them to be eventually abandoned. Their escape wheel reached its locking position by pushing directly on the balance staff in such a way that the oscillations were constantly disturbed, with the result that the timing adjustment of the watch was seriously affected. Finally, horologers realized that it they were to obtain good adjustments, it was imperative that they create a system whereby the balance could oscillate freely. Since ships on the high seas needed the right time to be able to navigate correctly, clock makers dedicated much research on creating esca-pements where the escape wheel came to rest, not on the balance staff, but on an intermediate part, independent of it. Towards 1760, simultaneously in France and in England, two horologers succeeded in creating the first detached escapements. The lever escapement was the invention of the Englishman, Thomas Mudge (1715-1794). In its current form, it is shown in Figure 4. The wheel comes to rest on an intermediate part called the lever. In French, it is called ancre (anchor) because it looks vaguely like a boat anchor. The balance causes the release of the wheel by means of a pin that enters a fork attached to the lever. It receives a small quantity of energy that is sufficient to maintain the oscillations due to the wheel sliding over the inclined faces of the lever as soon as it is released from its locked position. The lever provides both the locking position and the impulse. The simplicity of this system, combined with its dependability, has resulted in its use in nearly all mechanical watches. It should be mentioned, however, that the rather unnatural movement of the entry pallet, E, (Figure 4) produces an engaging friction, requiring that the teeth of the wheel be lubricated. Also, the trans-mission of energy to the balance by the lever and fork is less efficient than the direct action of the wheel on the balance. Figure 4: Lever escapement. The escape wheel is locked alternatively against the pallets E or S. Figure 5: Detached escapement. Designed by Pierre Leroy, this escapement uses elements of the lever escapement for the locked or unlocked positions, and the detent escapement for the impulse. In 1764, the French horologer Pierre Leroy (1717-1785) constructed a marine watch equipped with an escapement detached from his invention (Figure 5). 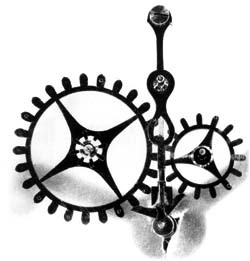 This was a marriage between Mudge's lever escapement and one that would later become the detent escapement, providing direct impulses. The lever, D, with its pallets, A and B, provided the locking position of the wheel, while the latter gave the direct impulse to the balance via the catch, E. In its early existence, improvements in this type of escapement were carried out by Ferdinand Berthoud. Later, the London clockmakers, John Arnold (1736-1799) and Thomas Earnshaw (1749-1829), made changes which resulted in its current form (Figure 6). 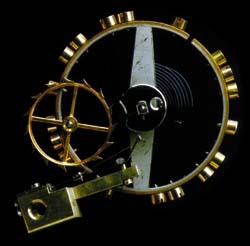 The detent escapement is still used in marine chronometers today. It is, without a doubt, the most efficient escapement although this has never been formally proven. Other small advantages of this device, which are beyond the scope of the article, make it a very interesting escapement for use in precision chronometry. The wheel is locked against a long detent spring, while the impulse is provided by the table roller fitted to the balance staff. The detent escapement is sensitive to movements or shocks and does not always maintain its locking position very successfully. It impulses in only one direction and can accidentally move past two teeth at a time during each vibration when the amplitude is too large. This phenomenon is called tripping. The detent escapement will not start again by itself. If the watch stops because it is wound down, it will not begin on its own once it has been wound up and needs to be shaken a bit to get it started. The great advantage of this type of escapement, however, is that it does not require lubrication. 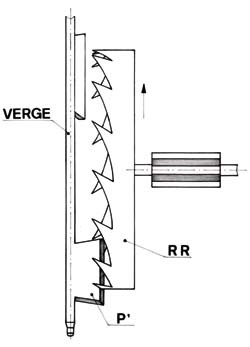 Figure 6: Detent escapement. The locking position occurs against the detent spring. The impulse is direct, but in one direction on the pallet, N, placed on the table roller that is concentrically attached to the balance staff. 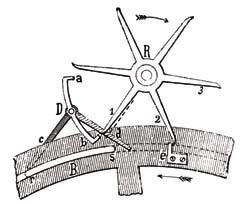 Figure 7: The natural escapement as conceived by Abraham-Louis Breguet. Understanding the advantages and disadvantages of the lever and detent escapements, one can be greatly tempted to imagine a single escapement that combines the advantages of both systems without their drawbacks. This is exactly what the talented English watchmaker, George Daniels has done with his coaxial escapement for the brand Omega. Before going into more detail about the current device, lets look at what has been done in this same direction over the last two centuries. It should be no surprise to find the name of Abraham-Louis Breguet (1747-1823) linked to this type of escapement system. His first realization in this regard was his natural escapement in which the oscillations of the balance were maintained by direct impulses, which were given by two escape wheels acting alternatively on two small wings attached to the balance staff (Figure 7). The first wheel was turned by the fourth wheel acting on its pinion, while the second wheel was geared to the first. The escape wheels, in their locked position against the pallet mounted on the fork, were freed at each turn of the roller-pin placed on the table roller of the balance, which worked with the fork, as in the case of the lever escapement. The direct impulses occurred in a natural way thus giving rise to the name of this system. Breguet's new escapement could also function without the need for oil. The gain in energy in relation to the lever escapement system is deceptive because of the gearing ratio of the two wheels and the sum of their inertia. Since he very quickly recognized its limitations. Breguet used this type of escapement very little. 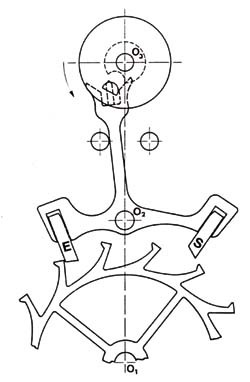 Figures 8: The lever escapement and detent escapement as designed by Breguet. The direct impulse is transferred from the wheel to the impulse pin of the table roller. Figure 9: The lever escapement and detent escapement as designed by Bise. The direct impulse is made on the catch, n, of the table roller. A drawing on page 320 of the book The Art of Breguet by George Daniels, depicts an escapement that Breguet realized around 1820 (Figure 8a). 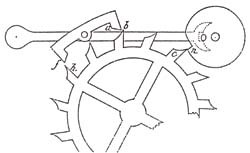 Here, one escape wheel ensures the functions of the locking position and the impulse, as in the lever escapement, but the entry pallet only serves to lock the wheel (Figure 8b). As soon as this wheel is released by the action of the balance and fork, it directly impulses the pin of the table roller without involving the lever (Figure 8c). The impulse given by the exit pallet is the same as in the lever escapement. This system combines the lever and detent mechanisms and has been copied and reinvented a number of times over the years. The remarkable watchmaker (and editor) Joseph Flores* cites seven watchmakers who have exploited Breguet's idea. Around 1860, or forty years after Breguet, an abbot and horologer by the name of Bise presented an escapement functioning exactly on the same principles as the one created by Breguet (Figure 9). The direct impulse is given using a catch on the table roller rather than a pin. This is the only difference of any importance. In 1860, La Revue Chronom�trique of Claudius Saunier recorded a debate between Abbot Bise and a certain Mr. Racap who claimed to have constructed the very same escapement in 1853. Joseph Flores also writes that a watchmaker named Jules Pellaton from Bienne filed a Swiss patent, Number 101849, on November 16, 1923 using a similar mechanism. 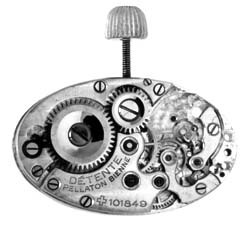 Pellaton also believed that he was the first to have invented this type of escapement and used it in one of his oval ladies' wristwatches (Calibre AS 610, Figures 10). Figure 10: Pellaton's oval Calibre AS 610 as it is mounted in a watch. 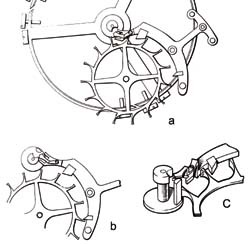 Figure 11: A coaxial lever and detent escapement from the beginning of the 20th Century. As far as the basic functions go, the coaxial escapement created by George Daniels does not significantly differ from those models discussed above, namely a direct impulse by the table roller of the balance and an indirect impulse by the fork on the impulse pin. However, Dr. Daniels deserves a great deal of credit for understanding how to optimise the functions of this escapement in order to obtain a level of efficiency superior to that of the lever escapement while preserving the reliability of the latter. He succeeded in greatly minimising the sliding friction by completely separating the functions of locking and impulsion. To this end, the lever has three pallets. The two lateral pallets, F and H, are used for the locking and unlocking positions. The central pallet, G, receives the impulse via the pinion of the escape wheel, C, which acts as the second escape wheel. The wheel, D, ensures the locked position alternatively on the pallets F and H and also gives a direct impulse on the pallet, J, on the table roller of the balance. The pin, L, works with the fork to release the locked wheel and receive the indirect impulse. The position of the central pallet in relation to one of the teeth of pinion, C, ensures a quasi-tangential impulse with very little friction. None of the earlier escapements offered this same advantage. Besides the gain in force transmitted, the arrangement of the various elements in this escapement allows it to function without oil. The principal advantage of the coaxial escapement is the transmission of force in a quasi-tangential manner, which minimises the losses due to friction, reduces wear and tear, and eliminates the need for lubricating the escapement. There is greater stability in the timing adjustment and consequently a significantly higher level of reliability. The efficiency registered is 28% for this system while it is 25% for the lever escapement. The gain in energy transmitted is therefore on the order of 10% to 12%. The disadvantages of this innovative system are its higher costs and the need for a very high level of precision in the manufacture of its component parts and their assembly. Each measurement must be rigorously respected and nothing can be modified during assembly. This level of exactness is normally only possible in those enterprises with very sophisticated equipment and experience. The need for an intermediate wheel between the fourth wheel and the escape wheel also increases the price, as well as also slightly reducing the systems efficiency. Finally, if, contrary to expectations, it becomes necessary to add lubrication, the oil from the teeth of the pinion might spread to the gear of the intermediate wheel which would be very undesirable. In conclusion, Omega should be congratulated for having taken the bold and necessary steps along the road of innovation in an area that up to this time had seemed untouchable. *Authors note: Much of the information in this article on early escapements was taken from the book by Charles Gros, entitled, Echappements d'hor-loges et de montres, and from the remarkable work of watchmaker and editor Joseph Flores, much of which has appeared in various issues of the Revue de l'Association Fran�aise des Amateurs d'Horlogerie Ancienne, of which Flores is the principal editor. The author would especially like to thank Mr. Flores for his help and the kind use of his photographs to illustrate this article.